I like Manziel and the Aggies to bounce back in a big way against the Mustangs. I say a little improvement last week and had all four winners correct but a flat performance by Notre Dame and an iffy one by Northern Illinois cost me a perfect record against the spread. Let’s hope this week works out better. SMU (+28) at Texas A&M – Everyone is expecting the Aggies to have a let down following their tough loss to Alabama last week. I’m not buying it. The Aggies discovered they could play with the Tide once again and will be fueled by the fact that a BCS Title game re-match could happen if they win out. SMU comes in with a fantastic passing game but a poor running attack. Not the combination you want against an Aggies’ defense that gives up a lot of yards on the ground. 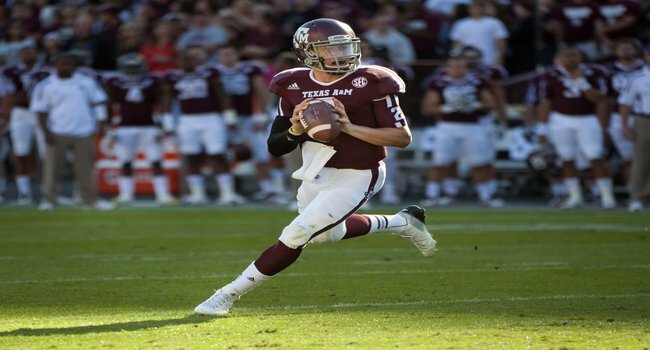 The Mustangs are 3-7 ATS in their last ten road games and that number could be a signal to look for the Aggies to win back and I think they will behind Johnny Manziel who looks better than he did last year. Michigan (-19.5) at UConn – Last week, Michigan avoided one of the worst upsets since…. well, since they were beaten at home by Appalachian State and then Toledo. Akron had three shots at the end zone from with the five yard line but couldn’t complete the deal and the Wolverines survived. There is no way that Brady Hoke’s Wolverines didn’t get the message this week in practice about their poor performance against the Zips and I believe that will propel them in their first road game of the 2013 season. UConn has lost games to Maryland and Towson State. Yes, I said “Towson State.” The Huskies boast a 1-4 record at home ATS in their five and have one of the worst running attacks in college football. I don’t see how this spread isn’t higher. Take the Wolverines and run. Can Butch Jones and the Vols bounce back against rival Florida? Tennessee (+16) at Florida – The Gators enter the classic match-up with Tennessee off a bye week in which they had plenty of time to sulk over a tough loss to Miami in South Florida. Tennessee spent last week getting taken to the woodshed by Oregon early and often. The Vols bring a record of 1-3-2 into the Swamp against the spread in their last six games against the Gators. Tennessee runs the ball very well at a clip of over 240 yards per game, but now they face their stiffest test with the Florida defense. The Gators will force Tennessee to throw the ball much more than they want to and with a passing attack ranked 114th in the country who could blame them? I think the Gators cover at home in Gainesville. Arizona State (+6.5) at Stanford – Both teams enter this pivotal Pac-12 showdown at 2-0 but something will have to give. The Sun Devils are in the top ten in the nation in passing while Stanford is among the top 25 in defense. The biggest question for ASU is are they ready to win a big game? Yes, they defeated Wisconsin last week in Tempe, but are they ready to go on the road and win? The Cardinal have been very matter of fact in wins over San Jose State and Army. They scored 34 points in both games and had very good balance offensively. Two numbers stick out in this contest however. ASU is 4-7-1 ATS in their last 12 games against the Cardinal and the Sun Devils are 1-5 ATS in their last six trips to Palo Alto. I’m going with Stanford to win by at least a touchdown.